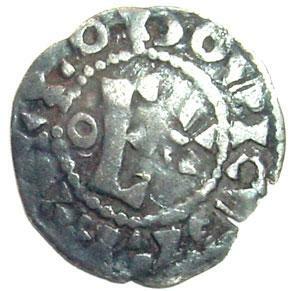 The coin: AR denier, 6th type, 19mm. Obv: LODOVICVX REX, grand E, annulet, cross. Rev: STAIII CVTELLVTII, central cross, A in opposite quadrants. D106. The king: He is the son of Philip I and Bertha of Holland, and called Louis the Fat. As 'king of France,' his territory was actually limited to the Ile de France, a series of territories running down the center of modern France, from Sens in the north to Bourges in the south. His major accomplishment was a series of administrative reforms that shifted power in his territory away from feudal holders of administrative functions to people (clergy and lower nobles) who were more committed to the king than had previously been the case. The times: modern France does not exist, and will not for centuries. It is a series of feudal principalities often in conflict with each other, and having weak allegiance to the king. The Duke of Normandy has become king of England in 1066, leaving many of the English Normans with French land holdings, laying the foundation for a split allegiance. This will not be finally resolved until the mid 1500th C, and will color French-English relations in the intervening centuries. 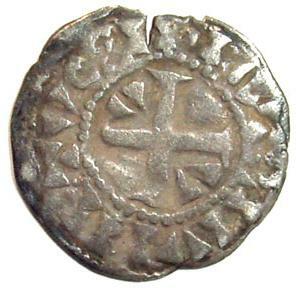 14.12.200: [...] This is a coin of Etampes. The reference is to Duplessy, a French coin reference book. The coin is a different color on front and back - I guess due to stain from the soil. Please feel free to use the image on your page [...].